Australian Druidry: Connecting with the Sacred Landscape is a Pagan Portals book, written by Julie Brett and released in 2017. Like most Pagan Portals books it is not a large book and does not take long to read. I managed to get through it in a few hours, with interruptions. My overall impression of this book is that it’s a good start, has a great variety of ideas on how to adapt Druidry, and by extension other forms of Paganism, to Australia. But at the same time it is perhaps lacking in what many Aussies are actually after – specifics. It is a book I think should be on every Aussie Pagans bookshelf. Australian Druidry is broken into three parts. Part 1 deals with what is essentially several introductions. An introduction to Druidry, a discussion of what Australian Druidry is and an introduction to the author, Julie, and how she began on the path that lead her to writing this book. Part 1 takes up 25% of the book and holds little in the way of information about Australia itself. Part 2 of the book is named Connecting with Nature and deals with the wheel of the year, the seasons, animals and plants, among other similar things as well as how to create an Australian Ogham. 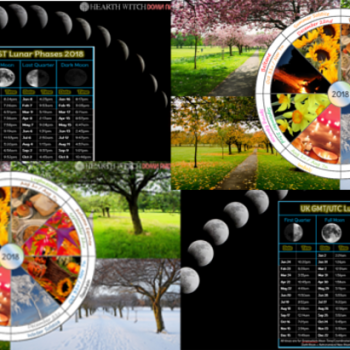 It discusses the traditional wheel of the year and how this does and does not fit in Australia. It discusses how we can adapt the Wheel to Australia and how we can create our own Wheel for our regions. It includes examples of adapted/created Aussie Wheels of the Years and examples of seasonal differences. 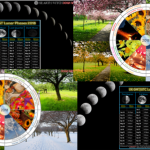 Julie also shares how we all might go about finding out about the seasonal patterns of our local areas and how to create a new Wheel from those observations. There are also sections within part 2 on the animals of Australia and the trees of Australia, both of which are perhaps exactly what Aussie Pagans are really want to read about. Correspondences of our native wildlife rather than the wildlife of other countries. Sadly, these sections don’t give as much information as we might like. Of course, it is not exactly an easy thing to discuss every single one of our animals, trees and plants, and this book is obviously not about these things specifically. Still, it’s a slight disappointment. Part 3 of the book, is about how to practice Druidry in Australia. It is divided into sections that each discuss a part of a single long ritual. This overall ritual format is Druidic in nature, so not entirely helpful to all Pagan traditions, but it is full of some interesting information and ideas. This Part is about each step of a general Druidic ritual, including how it can be adapted to Australia – with examples of rituals, chants and the like. As part of Part 3, the author delves into acknowledging the native people and spirits of Australia. She discusses the fact that it is an important part of Australian Paganism to learn about the Australian Aboriginal peoples, especially those of your local region. Learn the name of the local tribe, their history, their beliefs if possible. Name them, acknowledge them, thank them in your rituals. 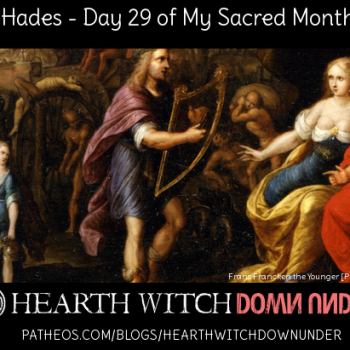 Take note of sacred places in your area (including those you should perhaps not be doing your rituals at). Discover the local spirits or your area, and the specific places you do your rituals. Ask them if it is okay to work where they are, what they want from you when you are there. And if you get no answer, don’t think that is the answer. Ask again, and again. Change the question until you get a definitive answer. And also, don’t assume just because you get a yes one time that it is a yes for every time. 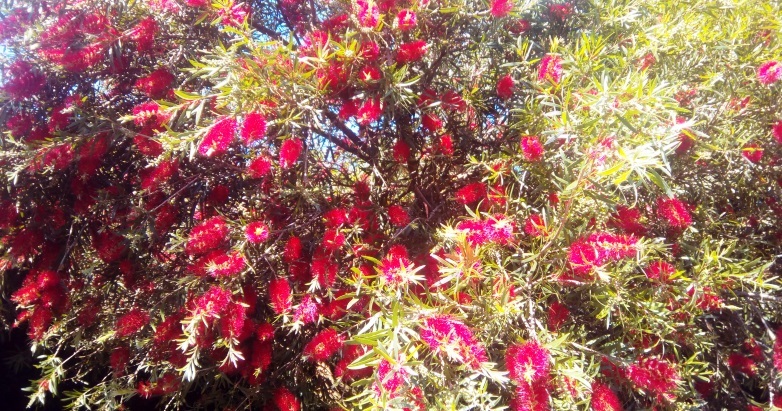 Bottlebrush tree in my backyard, flowering away in mid-November. I find this book fascinating for a number of reasons. I find a lot of the information to be wonderful, even if some of it is completely irrelevant to me. The Wheel of the Year adaptation examples given wouldn’t work exactly well for me personally, but that is a difference in tradition of course. I love the fact that Julie discusses the elemental correspondences (in Part 3) and the many ways we adapt them in Australia, but she mentions that the way that works best for her and her group is actually to use the three realms – land, sea and sky. This is interesting for me personally since it matches so well with how we do things in Hellenism and our divisions of Chthonic, Oceanic and Ouranic. But I have to admit that the thing I found most interesting about this book is something more personal, it was like reading my own 180 Degrees of Separation blog series that I released last year. The similarities between my series and this book is fairly notable to me, though the author and I have different writing styles and she is writing about Druidry whereas I was more going for general Paganism. Still, it is very similar. This is actually a good thing in my mind, it means my way of trying to adapt is workable for the most part. It is and has worked for a Druidic system, so I should be able to make it work for my Hellenic system. The fact that this book reminded me so much of my own blog series, means that I didn’t get a whole lot of information from it that I didn’t already know. Other than the small lists of animal and plant correspondences, and a few snippets of things here and there – this book didn’t really give me anything new. Which is a pity, I was hoping to get something new from it. This is not to say it isn’t a great book though. 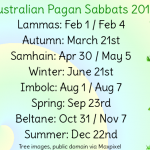 It is informative and helpful for any Aussie Pagan, not just Druidic Pagans. I think it is a valuable addition to any Pagans bookshelf, in fact it should be mandatory reading for the Aussie Pagan. It is the perfect way for us to remember that this is not the northern hemisphere, this isn’t the UK or US, this is Australia and everything here is different. Because of those differences we should be doing our Paganisms different as well. It’s common for Aussie Pagans to not realise this until they are years into their Pagan journey, so a book like this on the beginner Pagans shelf is, to my mind, necessary. I wish this book existed back in the mid-90s or even early 00s so that I could have learned some much needed lessons when I was much younger. Maybe then I wouldn’t have wasted so much time trying to force myself to do things in ways that never really worked out. 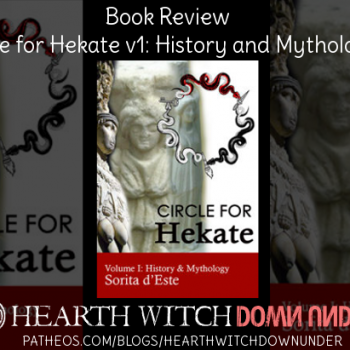 I hope this book becomes popular with all newbie Pagans in Australia, and becomes part of every Aussie Pagan recommended reading list.